During the marketing program "We solve problems of the client in a new way" strategy communication company Publicity Creating sums up the first results of January-February 2011 for a group of companies BIONA – Ukrainian manufacturer of biological products for the agricultural sector (based in Crimea). February 1, 2011 we held a round table "Organic agriculture: the Ukrainian perspective” for a group of companies BIONA, with the participation of representatives of relevant ministries, academics and experts. 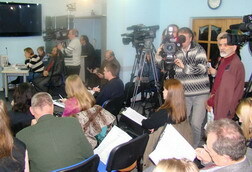 This event was attended by over 40 journalists, including representatives of specialized agricultural market media and leading Ukrainian TV channels. In the process of preparation Publicity Creating was set by enough ambitious goals: to attract media attention to the subject of organic agriculture in Ukraine, and to create of a loyal journalists pool "from scratch". They have been solved very successfully – for today more than one hundred publications on the theme received, and a group of companies BIONA became known among the media as an innovative company that not only develops the Ukrainian market of biological products for agriculture, but also assists to informing the public about its benefits. Also, on February, 3 the seminar "Effective technology of soybean cultivation” was held at the exhibition InterAgro 2011 for a group of companies BIONA. This seminar was aimed to representatives of the agro-enterprises and agronomists. The main task solved during this event was to attract new partners and clients: many of the 200 participants expressed their readiness to cooperate. In addition, Publicity Creating held the video session with representatives of group of companies BIONA, and those plots will help news reports to reach the target audience. As is known, video can transfer much more information than traditional text materials. Outspread of video materials is an innovative and very effective method of promotion, which helps almost of all Publicity Creating clients to achieve high marketing results.